Does the school system really prepare our children well for their future? The founders of the Berlin startup Learning by Making were also asking this question. They want to build a bridge between schools and new technologies in their workshops and, by gamification, introduce children to coding and other necessary digital skills. The school system is often described as slow and inflexible. Implementing major changes in education and their nationwide adaptation is very difficult, especially in Germany, due to the federal structure. Although the introduction of a subject that would teach children media skills was requested more than a decade ago, very little has been done to make it happen. Children are very rarely learning programming skills, although many employers in all working spheres require such knowledge . There are a few startups trying to fill this gap and give children the tools they need to make their way in an increasingly digital society. The Berlin-based startup Learning by Making is offering workshops for children between the ages of 8 and 12. Among other things, the kids learn in a playful way how to program and use robots or 3D printers. Learning by Making is a merger of two startups. The first one is the Tablet Academy, which educates schools about the impact that digital learning and teaching can have. The second startup is the EduHeroes Club, teaching children digital skills. With their strengths combined, the two founders also want to make parents, teachers and policy makers aware of the number of digital learning methods and of the importance of digital knowledge and skills. “We want to bring innovation into learning. We want to open minds of teachers and other school administrators to show them all the great innovative solutions there are out there in education,” Annemike Frank, the co-founder of the startup confirmed during our visit of her workshop space in Berlin Schöneberg. The small room with a large front window facing Akazienstraße, where the Learning By Making’s office is located, is full of robots, laser cutters and other equipment. Meanwhile, there are many start-ups on the market, but also some established companies that specialize in building robots for kids. The cute robots from Robo Wunderkind, for instance, look like slightly larger Lego bricks. Children can assemble them in different ways, attach wheels and then program them using an app. 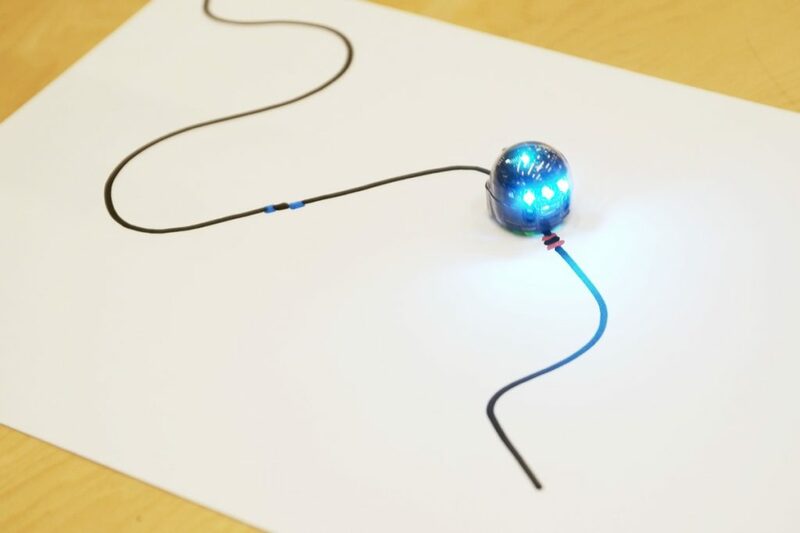 The much smaller Ozobot robots combine creativity and programming, letting kids both craft and paint. All kids need are a few coloured pencils and a white sheet of paper. The children can then draw a line on the paper with a felt-tip pen. Depending on the colour used, the Ozobot speeds up or slows down when driving independently along the drawn route. Of course, the kids can program various markings using an app. At the moment, the startup is focusing on workshops for children. However, they also plan to offer workshops for students and young enthusiasts. Annemieke would especially like to address prospective teachers as a target group and further establish mobile learning spaces.